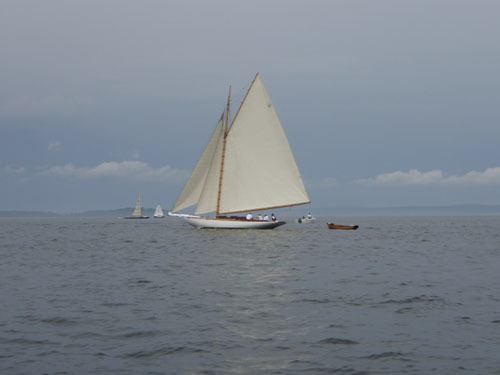 I’ve been a wooden boat enthusiast for over twenty years, so jumped at the opportunity to crew aboard my friend’s recently launched, Herreshoff-designed Buzzards Bay 30 in this year’s Eggamoggin Reach Regatta in and around Penobscot Bay. I flew into Maine from Oslo on a disorienting sequence of flights and arrived at the Belfast City Dock at 3 AM, taking a taxi from the Bangor airport. 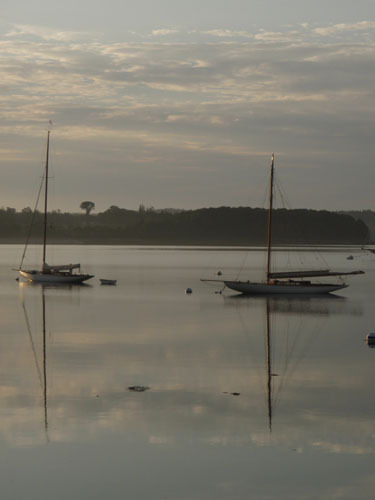 I slept aboard the tender BURMA for a few hours and awoke to find the fleet of three Buzzards Bay 30s docked to our starboard, about 100 yards from French and Webb Boatworks where they were launched the previous month following a two year restoration to their original, 1902 condition. The all-wood Eggamoggin Reach Regatta is preceeded by three ‘feeder races’ which allows for the full fleet to gather and for the crews to reunite on and off the water in anticipation of the final race. Aboard the ‘Quakeress II’ we raced from Belfast to Castine on the first leg, working out how to move as a crew of six, learning the ropes and getting a feel for how the boat handles under sail. Todd French (of French and Webb) served as our sailing expert, navigator and all-around ‘salty dog’, which gave me a chance to learn firsthand about the boat’s construction and history, lending perspective as we sailed from port to port along Penobscot Bay’s maritime shores. 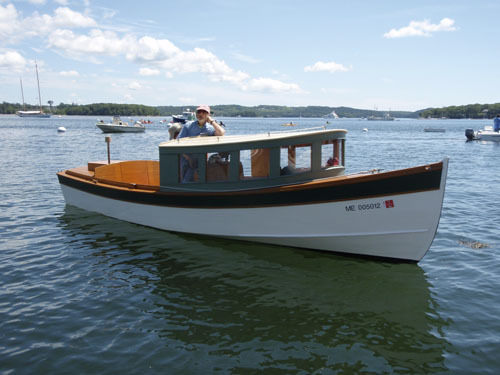 I was thrilled to be included in the unique historic moment of the revival of the remaining class of Buzzards Bay 30s in the heart of America’s wooden boat culture. 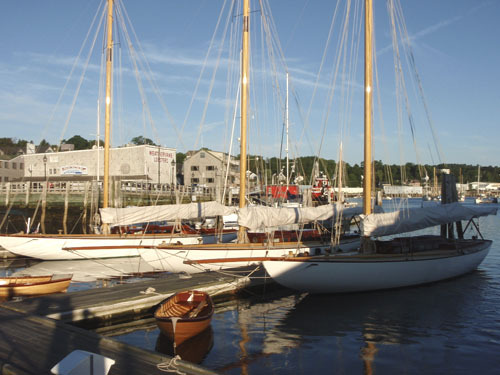 The tedious restoration of the Herreshoff fleet is featured in a recent WoodenBoat Magazine article by Maynard Bray, who we met frequently as he tailed the fleet in his lovely ‘Handy Billy’ launch, gathering notes for a soon to be published follow-up. Given the unlimited resources available for the project, the completed boats approach fetishism in the level of detail attained, which suggests one of two things; either an invitation for disappointment and constant maintenance, or a kind of spiritual abstraction, a physical manifestation of the purist ideology underlying the cult of wooden boats. The level of craftwork behind such a restoration is no longer necessary for utility or economy, so the endeavor becomes an exercise in pure aesthetics. 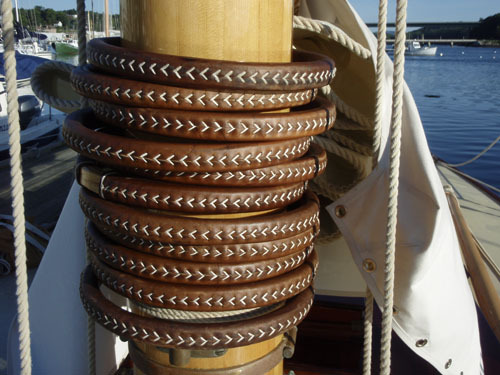 Traditional boat-building is a kind of reenactment of or homage to a time when the material technology was in sync with the intended use of its by-products. In 1902, these were highly innovative designs, and Herreshoff’s shop knocked off a fleet of 14 in 5 months time, which I doubt were this lovingly detailed (though I’m sure they functioned as well). 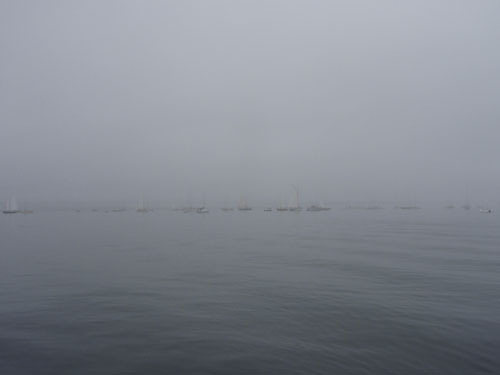 As we sailed and raced from Castine to Camden; Camden to Brooklin and finally in the Eggamoggin Reach, under conditions ranging from light rain to heavy fog with light winds, I gained a new perspective as our crew got in sync and the boat asserted itself on our collective consciousness. The emphasis shifted to the vessel’s social dynamic, and our collaborative efforts seemed a logical extension of the boat’s design and aesthetics. In spite of the logistics of tacking through a fleet of up to 100 wooden boats through narrow channels, our crew was silenced by the natural world surrounding us and gave in to the slowly emerging consciousness of the boat itself, our temporary home. As the crew acclimated to the the boat’s formal constraints, we became finely tuned to the seals, porpoises, schools of herring, migratory birds and signs of gusts of wind on the horizon. We placed first among our fleet of BB30s in the Eggamoggin Reach Regatta by raising our centerboard and surfing the current as others surrounding us raised spinnakers in the vain hope for more wind. Hats off to Herreshoff! Posted by Scott on August 12th, 2008, at 1:09 pm, and filed under all, expedition, maintenance.